It is common to feel aches and pains in pregnancy. This is because your body is changing shape, you are carrying more weight and your hormones are relaxing the ligaments and muscles throughout your body. Typical areas that you may have aches and pains in are the low back and pelvis, the pubic joint in the front (symphysis pubis joint) or the wrist and hands with swelling and numbness (carpal tunnel syndrome). The advice below may help to prevent or decrease discomfort during your pregnancy. For more advice, talk to your midwife, LMC or GP. If symptoms persist, you may need to see a women's health physiotherapist. Discuss this with your midwife or LMC. Pregnancy hormones can also cause changes in your mouth that can lead to gum disease. Learn how to look after your teeth and gums to avoid problems during pregnancy. 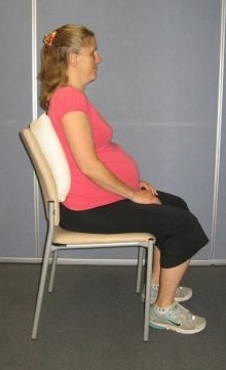 Good posture: This will help to protect your back and pelvis. Avoid slouching. Think tall, shoulders down. Standing (far right): Avoid standing for long periods (more than 40 minutes), Stand with even weight through both legs and avoid a sway back position (far right). Sitting (right): Sit with your back supported and use a small cushion or pillow to support your lower back. If you put your feet up, keep a curve in your lower back. Avoid side sitting or crossing your legs, get up every 30 to 40 minutes. Lifting: Bend your knees and not your back. Avoid heavy objects and long periods of lifting or bending. Sleeping: When sleeping on your side you can use a pillow between your legs, under your abdomen, or behind your pelvis. A longer pillow can be useful. Try one or both knees bent up. Roll onto your side with bent knees to get out of bed. Housework, gardening, and so on: Don't strain or overdo it. Take regular rest breaks. No heavy work. Comfortable clothing: Wear comfortable flat shoes. High heels can tip your pelvis forward and put strain on your back. 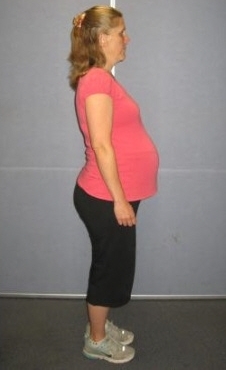 Clothing that supports the lower tummy or a maternity support belt may be useful. Exercise: If done regularly, exercise can benefit your posture and relieve aches and pains. Walking, swimming, low-impact gym or classes are good. Check with your LMC or GP if you have any health concerns. Christchurch City Council leisure centres run a variety of pregnancy fitness classes, your LMC may know of more. Also check out libraries or book stores for a range of DVDs or books on exercise in pregnancy. Back care: Advice as above. Sleeping: Use a pillow as support between the thighs. Keep your knees together when rolling over and getting in and out of bed. Wearing silky pyjamas or using silky sheets may help when rolling over. Sit to stand: Keep knees together, lift your pelvic floor muscles before you stand. Car: Use something slippery (such as a plastic bag) on the seat to help swivel your legs into and out of the car. Activity: Walk with smaller strides. If possible, avoid stairs, squatting down, or positions where your legs are apart or crossed over. Exercise: Swimming is a good option for decreasing the load on your joints. Try freestyle or gently kick with a kickboard (front and back). No frog kicking. 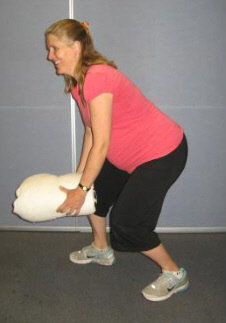 See Pelvic floor muscle exercises in HealthInfo or ask your LMC for a pamphlet. Strengthening these muscles may help to relieve some aching in the pubic joint. The best positions for exercising the pelvic floor muscle is lying on your side or sitting comfortably. Rest the affected hand(s): Avoid activities that increase soreness (such as typing or lifting). A wrist support splint may help. Contrast baths: Hold the sore hand in a basin of warm water for 15 seconds then straight into a basin of very cold water for 15 seconds. Alternate for 10 to 15 minutes. Do this first thing in the morning and/or before going to bed. Afterwards, elevate and gently open and close your fingers (like scissors) to exercise the joints and move fluid. Sleeping: Avoid sleeping on your hands. Try to rest your arm on a pillow. If you wake with pain, try shaking your hands to decrease the pain and numbness. Wearing splints at night can help reduce symptoms. Written by Physiotherapy Services, Christchurch Women's Hospital. Endorsed by HealthInfo clinical advisers. Last reviewed March 2018. Allied Health – Physiotherapy Services, Christchurch Women's Hospital. Looking after yourself in pregnancy - patient information. Authorised by physiotherapy team leader, Christchurch Women's Hospital. Ref 7223. June 2013.